Experimental product designers have done a lot to renegotiate flat pack furniture’s reputation as a inconvenient necessity in recent years. We have seen various lines of furniture such as Modos and MAGfurniture which can be put together without tools or confusing user manuals. 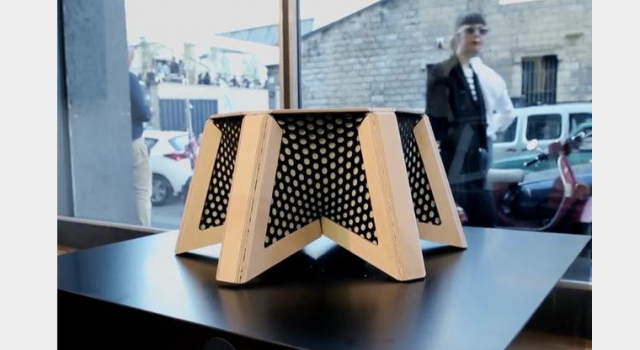 Now, a collaborative project between MIT Self Assembly Lab and Wood-Skin has yielded the Programmable Table — a piece of reconfigurable furniture which transforms effortlessly between conditions: from shippable flat pack to fully functioning table without any human or machine assembly. The Programmable Table begins its life as a flat hexagon, which can be transported and stored easily. The product is made of a combination of wooden panels and ‘programmed’ fabric muscles: when it is removed from the box, one small tug will cause the muscles to pull the table into shape. Once upright, the table’s structure supports itself and can hold up to 220lbs of weight. A prototype of the Programmable Table was presented at the Salone Del Mobile furniture fair in Milan earlier this month and could soon be a commercial product or even the first of a small line of self-assembling furniture. What other products could make use of this design technology?